Our 14th KENYA PHOTOGRAPHY EXPEDITION is among the best locations to photograph wildlife in the world. If you’ve never visited this magical country, be prepared for incredible wildlife and cultural experiences. From the monkeys trying to get into your tent to the lion prides of the Mara, YOU WILL ENJOY! The photography opportunities are endless and your stories will be shared for many years to come. A few different lodges and hotels for our annual Explorers! Not only will we fly between lodges, but we’ve also added two extra nights on safari this year—2 nights in Nairobi and 12 nights at the lodges—along with a private encounter at the David Sheldrick Wildlife Trust elephant orphanage. Only 3-4 guests max per safari vehicle as always! Kenya will not get better than it is now—join us! Arrive in Nairobi (NBO). Our tour representatives will greet you at the airport upon arrival and transfer you to the Hemingways Nairobi hotel. Overnight at Hemingways for two nights. We stay two nights in Nairobi to give extra time for unexpected travel delays and to recover from jet lag. Visit, shop, and have lunch at Matbronze, a beautiful gift shop and cafe that specializes in African bronze statues, art, and high quality gifts. We’ll have an afternoon private excursion to go see the rescued baby elephants at the Sheldrick’s Elephant Orphanage. Get up close and personal with these wonderful African animals and support a great cause! Fly to Amboseli National Park. Stay three nights at Tortilis Camp with game drives daily. Amboseli National Park covers 151 square miles, only a small portion of the surrounding nearly 1,200 square miles of the Amboseli ecosystem. Tortilis Camp is on the southwestern edge of the park and overlooks its own private 30,000 acre wildlife conservancy, Kitirua. Away from the busy eastern side of Amboseli and with its own private conservancy, guests experience a wild and private Amboseli. The area is famous for the dramatic views of Kilimanjaro, the highest free standing mountain in the world, and the highest peak on the African continent. At 19,340 feet, Kilimanjaro rises dramatically out of the Amboseli plains. Despite being in Tanzania, the best views of the mountain are from Amboseli, with Tortilis Camp on a southwest hillside facing the mountain—the most dramatic view of all. Amboseli is famous for its elephant herds—a population of over 1,500! Amboseli has some of the largest elephants in Africa, and the guides at Tortilis Camp know the individual elephants, their family history, and are able to get very close to the habituated herds. Much of Amboseli incorporates the dried up bed of a Pleistocene lake, with lush deep freshwater springs in the middle of the park, a haven for hippos and birdlife and a playground for elephants. As well as plentiful plains game and their predators, the area hosts its own eastern white-bearded wildebeest migration, a population that is genetically separate from the Masai Mara/Serengeti population. Today we’ll board a scheduled flight and make our way to Lewa Safari Camp in Lewa Downs where we’ll stay three nights with game drives daily. This camp is based within the private 65,000 acre wildlife conservancy of the Lewa Wilderness Trust. The conservancy is home to about 10% of Kenya’s black rhino population and the single largest population of Grevy’s zebra in the world. The big five are often seen in this area. Lewa reinvests all the profits generated from tourism (including profits from Lewa Safari Camp) into its core programs. When you visit Lewa, you will help thousands of people from different backgrounds and cultures improve their lives, help to give their children a future, and also ensure Africa’s wildlife has a stable home. In past years we have been lucky to see wild dogs here! Fly to Masai Mara National Reserve. Stay six nights at Sand River Masai Mara Camp, which is located in Masai Mara National Reserve near the Tanzanian border. Game drives daily. All the big cats, elephant, black rhino, and plains game spread out before you. It’s better than the Discovery channel because you are part of the spectacle. We cannot forget the impressive birds including the crowned cranes, tawny eagle, secretary bird, and kori bustard. Other creatures include common zebra, warthog, hyena, gazelle, hartebeest, wildebeest, Masai giraffe, reedbuck, banded mongoose, and hippos in the river. Year-round babies and young can be seen. The Mara is spectacular! Return flight to Nairobi mid/late morning. Private day rooms at Crowne Plaza Nairobi Airport. Evening flight home. This day will give you time to repack, visit some gift shops, or relax at the hotel by the pool. We’ll have our last dinner together as a group before leaving for our return flights home in late PM. You’ll gain a day on the return, so you should be home late day on February 11th. SCROLL DOWN THIS PAGE to see images Explorers took from past NE Kenya trips! 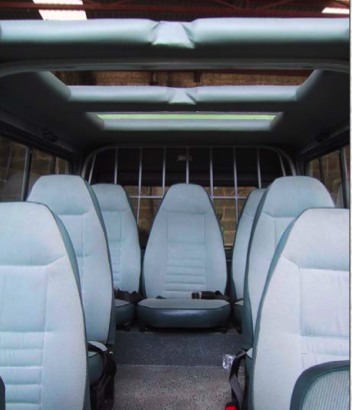 There are two different seating/pricing structures in the safari vehicle, depending on your needs/preferences. OPTION 1: FULL SEAT Allows each guest to have a seat and window on both sides of the vehicle. This gives ample room for camera gear and allows for photographing from both sides of the vehicle. This is a luxury not all tour operators offer! OPTION 2: SHARED SEAT We receive many requests from couples who wish to share this bench, reducing the cost of the overall trip. This space is recommended if your spouse or partner does not photograph as much and you have minimal camera gear. We use the third row bench seat (three seats across) for two guests. Depart Nairobi (NBO) in the evening. Most flights depart between 10:00 and 11:00pm this evening. Arrive home on February 11th. All services are provided by operators who are not owned or controlled by Natural Exposures. Natural Exposures takes all reasonable precautions to make these safaris as safe as possible for travelers and others. Natural Exposures and its agents shall not be responsible or liable for any injury, loss, damage, delay of inconvenience arising out of, or in connection with, any defect in any vehicle or aircraft or any act, including any acts of terrorism, industrial action, acts of governments, war, terrorism and God, omission, neglect, accident, error or omission in the provision of any services. Any travel involves some measure of risk, of which travelers need to determine themselves. We stay at permanent tent camps for the true African adventure. “Tenting” includes four-post beds, flush toilets, and hot water showers. No roughing it here! Swimming pools available at some of the camps to help cool down midday between game drives. This boutique hotel elevates the standard of luxury for travellers in the region. Beautiful in its symmetry and flooded with natural light, this plantation-style property is airy and spacious. Each of their 80m² suites have a private balcony overlooking the iconic silhouette of the Ngong Hills, a magical view which can also be enjoyed over sundowners at the bar. Their service is personal and sincere, offering a luxury experience from the moment you touchdown in Kenya. Your dedicated butler will know that you prefer Earl Grey to Assam with your scones and will remember which trousers you like pressed flat and which ones need a central crease. So while you are indulging in the spa, relaxing beside the pool, or meandering through the gardens, back in your suite, your butler will have dimmed the lights, adjusted your personalized pillows, set out your nightcap, and arranged the morning’s outing down to the finest detail. Part of the Elewana Collection, Tortilis has been carefully selected for its unique accommodations, iconic location, and providing extraordinary game viewing in exceptional comfort and style. Each of the Elewana Collection demonstrates its responsibilities toward reducing environmental impacts by employing renewable energy resources, local materials, and waste management controls when possible. Each tent at Tortilis enjoys glorious views of the impressive Mount Kilimanjaro and consists of a main bedroom, en suite bathroom, and spacious verandah. Relax in Torilis’ main lounge or dining and bar area. Enjoy cool waters during the heat of the day in their swimming pool, which is surrounded by palms and lush green gardens. It’s a haven for tropical birds, and there is bar service and board games poolside! Lewa Safari Camp is a stunning location within Lewa wildlife / rhino conservancy and has outstanding game viewing along with spectacular views of Mount Kenya to the south and arid the lowlands to the north. Each tent has a thatched roof, veranda and full en suite bathroom, very much in the ‘Lewa’ style. The central areas have exquisite gardens with a large sunny veranda, a swimming pool to enjoy during the day and cozy log fires in the lounge and dining room for the more chilly evenings. Sand River Masai Mara is located within Masai Mara National Reserve along a river, close to the Tanzanian border. Situated on a secluded and picturesque site, it replicates the heyday of exclusive permanent tented camps of the late 1920’s. Sand River Masai Mara has 16-tented accommodations. Rooms are en suite and include private flush toilet and shower. Thoughtful touches such as bathrobes and slippers, room service, and furnished patios are features of each tent. Hairdryers and toiletries are provided. Sand River Masai Mara demonstrates all the qualities that have made the Elewana Collection the premier choice in East Africa. With carefully crafted interior designs, exceptional standards of service, and a sublime and carefully chosen location providing optimal access to the wildlife, Sand River Masai Mara will surely become the standard to surpass. Conveniently located less than 3 minutes from the airport, Crowne Plaza Nairobi Airport offers guest rooms with premium bedding for a comfortable sleep experience designed to make sure that guests are well-rested, energized, and ready for their next flight. The hotel features a contemporary café offering local and international cuisine round the clock, a coffee shop that offers the best handpicked flavors and unique culinary experience, and a bar with an amazing range of exotic cocktails, international wines, draught beer, mocktails, and starters for every mood. To ensure that you run your affairs smoothly, they have business center services, complimentary airport pick up and drop off within Jomo Kenyatta International Airport, and complimentary Wi-Fi. After a long day or long flight, renew your body with a workout in their gym or rejuvenate at the Euphoria Spa. Their relaxing roof top pool gives you a 180-degree view of the Mombasa – Nairobi highway complete with a bar and a mixologist to serve up delicious cocktails. Each safari guest will automatically be registered as a member of ‘The Flying Doctor Society’ (AMREF) in East Africa. Applicable charges are included in the cost of the trip. AMREF emergency air evacuation is limited to safaris in East Africa. Dan and Tanya fly Delta via Minneapolis and Amsterdam. They find there has been more restrictions in the past on British Airways for carry-on weight and size. We suggest going through Amsterdam if possible. You can usually get one free stop on the return (e.g. Amsterdam) with this long of an international flight. Some people will stop for a few days in Amsterdam on their return for a visit. Talk to your airline representative for details when booking. Starting in October 2018, Kenya Airways will offer a direct flight JFK-NBO. Kenya Airways is a Sky Team partner. Tourist Visa needed: EASY online application. We will send you a link to purchase before the trip. Tourist visas are valid for three months from the date of application. Your passport should have six months validity and two blank pages for the entry stamp. Morning safaris can be chilly—you may want to wear a sweater/fleece with a t-shirt underneath as it will warm up considerably by mid-morning. The afternoons will be very hot and the evenings are mild but not cold. On safari, most people wear shorts and a t-shirt during the day and put on a long-sleeved shirt and pants in the evening for protection from mosquitoes. Should you be particularly sensitive to the sun, a loose cotton shirt is essential during the day. A flashlight will be in each tent for when the generator is turned off later in the night. We usually bring an extra one or a headlamp. It is also good to have one at night while walking to and from the dining area. Snacks, trail mix, gum, hard candies – Crystal Light is good to add in a water bottle and if you have any extra at the end of the trip you can leave them for the guides – they love them! Clothing – Carry essentials in your carry-on, half your clothes in your bag and half in your partner’s bag if traveling with someone. If one of your bags is lost, you’ll still have half of your clothes. Flight bag – This is a small, lightweight carry-on that can be folded flat and takes practically no room when it is placed on the bottom of your bag. Comes in very handy when you bring back more than you can place in your luggage. You will also need an overnight bag at times if our big luggage goes a day early by vehicle. We’ll put a collection together in an envelope on the last day of the trip for the guides. We split gratuities equally among guides. Dan and I will leave an additional envelope for lodge staff from our group as a thank you. The service is excellent, the guides are excellent, and their livelihoods depend on our help. Tourism supports Kenyans which in turn protects the animals. You can leave your laundry each morning on your bed in your tent with the bag provided and your clean laundry will be returned to you by the time you are back from your evening game drive. No need to overpack please! There is netting around your bed only in the Mara. There are few insects but possibly mosquitoes in the evenings. The lodges provide insect repellent wipes in your tents to use too. We normally do not have an issue with insects or mosquitoes, but always cover yourselves in the evenings during dinner since we dine outside. Batteries, chargers, adapter plugs, and wide angle and telephoto lenses. Dan will phone each of you personally prior to trip time to discuss camera gear he suggests for bringing on safari. A roller backpack style bag works well. You can usually roll your bag to and from your tent to the vehicles. Nothing too big for the international flights—they are not as easygoing as they are in North America about carry-on. The word ‘safari’ in Swahili means journey. We seek to offer the best all-around journey by ensuring that our guests travel in comfortable, reliable custom-built vehicles. We offer two types of seating in safari vehicles with only three to four guests per eight-passenger vehicle. We work with only professional local guides who will ensure your experience in Kenya will be unforgettable. We consider them part of our family. 4-wheel drive Land Rovers and Toyota Land Cruisers are specially designed for easy observation and photography. Each vehicle is customized to give extra leg room and plenty of head room. Extra large windows and windscreens improve all-around game viewing and there is plenty of room for those who have cameras with big lenses. Three generous roof hatches in the rear offer plenty of room for overhead game viewing. We will supply each guest with a complimentary bean bag to use rather than tripods in the vehicles. Why visit Kenya in January/February versus the “popular time” in August/September? The population of animals, including endangered species, may not get any higher or better than it is now. With climate change, political corruption, famine, and poaching, we believe it will become increasingly difficult to travel to these incredible locations to observe and photograph these wonderful animals. "This is our third trip to Africa and the first time with Dan and Tanya and it was the best of all three trips." "Class and comfort all the way. Natural Exposures photo tours are run with the smoothness and efficiency of high-end travel outfits." "In the truest sense, expert guides in all the fauna and flora of Kenya and greater East Africa accompanied by a wizened mentor of photography." "The Kenya trip was our vacation of a lifetime – just when you thought it couldn’t get any better – every day it did. Excellent and knowledgeable guides, small group experience with fellow photographers was a very enjoyable trip." "If you visit Africa, you will want to experience the land, the people, and the wildlife. On this, my first trip to Africa, I have been fortunate to travel with Dan and Tanya Cox. They put together a trip that far exceeded my expectations using first-class accommodations and Kenya’s best wildlife guides. The sights, the photography, the food, and the comradely will always be remembered." "I am so happy I went to Kenya again. Everything was handled so smoothly and so well. Dan and Tanya made everything easy. We stayed at great lodges where the food was fantastic and the accommodations first-rate. I will definitely be traveling with you all again." "Tish and I thank you profusely for helping make our trip to Kenya an amazing experience. The logistics, accommodations, guides, wildlife viewing opportunities, cultural immersion, photography mentoring and help with Tish's bad ankle were all superb. The trip experience will stay with us forever as an inspiration to appreciate the world around us and to be thankful of our blessings. As you can imagine, it will take us months to sort through our photos and put them in a presentation format." "It's one of the best trips we've taken with superb guides! "Even though I'm a point and shoot photographer, I felt very much a part of the program. Dan was there to answer questions....but most of all, I was most impressed with the guides, making sure each one of us had a chance to get 'that shot' of an animal! "The individual attention was phenomenal; the tour guides took care of every detail; one would not have to carry a camera to see and enjoy all the wonderful animals of Africa. It was a trip of a lifetime and I would go back again!!" "Traveling with Dan and Tanya is a truly special and delightful experience! Dan's incredible expertise in all things photo and Tanya's exceptional attention to details and sensitivity to needs (be those of guests, guides, or the environment, cultures and wildlife you are going to see) makes for an amazingly well balanced team! Our recent trip to Kenya was just AWEsome - - in the true spirit of the word! The wildlife viewing was fantastic! In spite of heavy rains creating tall grasses, our exceptional guides (hand picked by D and T) consistently found not only wonderful wildlife sitings, but fabulous photographic opportunities! Along with exceptional accomodations and delicious and plentiful food the overall Kenya experience was absolutely incredible! Thank you Tanya and Dan for creating SUCH a wonderful and memorable experience!!" "It’s February 9th and I can’t believe that Cathy and I have been home for two weeks already. Our experiences in Africa are so fresh it seems as though we were just there. I’ve enjoyed blogging about our experiences over the past 10 days, hoping to share with you just a tiny flavor of what it was like. It truly was a powerful experience and we hope to go back some day. Perhaps to Botswana or Namibia. There are many things that made this a wonderful experience. At the top of the list are Dan and Tanya Cox. We have taken two tours now with Dan and Tanya and both were extremely enjoyable. Tanya is a magnificent organizer and makes sure that all of our needs are met. The tours are designed to place you in the best locations and give you the best opportunities for capturing great photographs and having great experiences. These tours are not highly structured photography teaching sessions but more informal learning opportunities." "I want to thank you for the most inspiring trip I've ever taken. Africa is forever in my heart & soul. It was more fabulous than I could ever imagined. And thank you so much for all the hours of preparation and the sweat & worry that I'm sure went into the trip. It was glorious..the accommodations were fabulous (love the elephants on my veranda! ), the food was scrumptious (thanks for the extra lbs!) and everything was smooth and relaxing. I really liked the photo instructions too...learned alot from Dan and the others. It was a very fun group! Thank you for everything and I hope to join you again soon." "Hi Tanya and Dan: The 2011 Kenya safari was everything we expected and more. The guides were extraordinarily knowledgeable and skilled. We still cannot figure out how Henry found the baby Leopard hiding in a thicket! We took almost 6,000 images and have just reduced them to about 1200. Cannot imagine a better safari. Thanks to Tanya for putting together a great trip and Dan for his photo instruction. We look forward to joining you on safari in India next year." "I love you and Dan, and love traveling with you. It was such an incredible trip all the way around, just like the last time, but better. I relished in every moment on every game drive, just how fortunate I was to be there with such wonderful people. I can't tell you how many times the emotions welled up inside just at the sight of such beauty. Thank You!, for letting me be a part of it." "Just returned from Kenya. Awesome trip with Daniel J Cox, Tanya Smith Cox, Natural Exposures and a bunch of fellow trekkers. Made a bunch of new friends."